Q: Any other coaches, special relationships, recollections? BB: Turner Gill. Turner was a protégé of Coach Osborne as a player, a coach. His coaching style was real direct. Some of us, we have to be real dramatic and all, but others will just say, “This is what needs to be done in this situation.” You might bring somebody down, but you must also tell them what they need to do right. All the coaches…. Charlie McBride had a gift, you had better be kind of a hell-raiser with him. And on offense? You better be nice but you’ve also gotta be nasty: and the offensive line was nasty. You don’t get paid to be nice. “We’re humble, but we’re gonna win.” That’s why they called them the Pipeline, “If you get in our way, we’ll roll over you.” Ron Brown, Frank Solich, those were guys that I related to, also. While I was there, a lot of people didn’t like my quirkiness, my nerdiness, they thought I was way out there, but that was what I knew. I wasn’t really a party person, I just wanted to know what the truth was. Now that I‘ve done it for 47 years it seems I have more questions than answers, but I truly cared about the players I worked with. Q: Have you sensed a change in the youth since your days at Nebraska? BB: Yeah, we’ve evolved into more entitled-minded programs. Kids are more entitled because we made them that way. Other people work very hard to get them into situations and now they don’t have to work very hard. 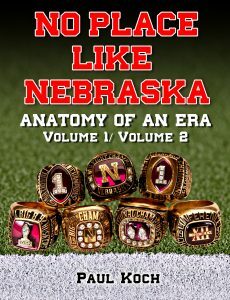 It helps to have an organization -from Tom Osborne to Pete Carroll- where everybody is going to work. If you don’t want to get better you’re going to have a tough time. Because it’s all about competition. And when you realize that: everything you do is about competition? Then you’ll go places. Kids like me because they know I’m a competitor and I’m going to put them in a position where I’m not only gonna make them better, I’m gonna make them the best. Q: The kids had so much respect for you because you were willing to push the envelope, push the limits. Every birthday you used to run your age in miles, right? When did that start? BB: When I was 24 years old. Q: What drove you to do that? BB: Because I wanted to do what nobody else had ever done, I wanted to be my own person. I said, ‘I’ve lived this long and I’ve been very fortunate, and I’m going to do something special to celebrate.’ I tell you what, when you turn 40 years old and you put those miles in, the last thing you’re gonna want to do after that is drink a lot of beers. (laughs) Now I’m at an age where I ought to start thinking about drinking 50 beers, instead. I might feel better about myself. (laughs) Anyway, I guess I just started running my age. Q: Does one birthday stand out as harder than another? BB: Yeah, 40: because it was freezing outside. November 24th. I had to stop at 42 because I had hip problems and I couldn’t run anymore, so I started doing it on the bike. And I had to stop doing the bike about 7 years ago. Now I make sure I go surfing on that day, instead. Longboard. Q: You were always on the sidelines. Any particular sideline situation stand out to you as momentous? BB: Yeah, I don’t know which game it was, but it was on national television and we were the ‘Get-back Coaches’…. BB: The ‘Get-back Coach’, what they do is, there’s players on the sidelines, and you’re supposed to stay so many yards off the field for the coaches and the referees, so the coaches and players don’t get on the field and run into the referees and get them pissed off. So you’d tell the players,‘Get back! Stay back!’ The coaches wanted to keep the players back (and sometimes we had to keep the coaches back. Some of those coaches are just a little bit insane, they lose their brain most of the time). Anyway, we’re in the middle of this game -I think we were playing Oklahoma at home- and everybody’s uptight. And I’m trying to keep the players back. Mike Arthur, myself, Randy Gobel, Boyd, John Archer or Jon Jost, we’re standing there and I’m supposed to be standing behind Charlie McBride. Anyway, the players keep getting up and across the out of bounds line there, and we got a penalty. And that was not good. BB: Mike says, “What was that all about?” I go, ‘I think he’s a little uptight.’ (laughs) So it was one of my more comical moments. Q: Any other special moments? BB: The best one was away from the game. It’s Phoenix, Arizona and we won our second national championship in a row. I get up the next morning, we’re staying at some resort, I forget the name of it. I’d go running every morning, getting up just to enjoy being alive (this is the day after spanking Florida) and I run like 500 yards. And lo and behold, I’m out there at 5 in the morning and there is Tom Osborne with his grandson. I said, ‘What are you doing?’ And he said, “Ah, Bryan, this is the best part of my day.” And I said, ‘What about the national championship?’ And he says, “Well, you know, I get up today and it’s over: today’s just another day. And this guy here needs all the help he can get.” That’s one of the greatest things I’ve ever seen or heard. Because most people think you get up the next day thinking you’re invincible -you’ve won the national championship- but it’s just another day and you have to do it all again. To this day I carry that with me, because I look at that and say, ‘That’s what life’s all about.’ He still had enough time to spend with all the people. He wore so many hats. And it sounds like I’m putting him up on a “God level,” but how he carried himself and what he did, it made me do the things I chose to do. That man deserves everything he gets, because for that little guy hanging onto his hand for dear life, that was greatness. Q: Very interesting answer, Bryan. BB: And the thing about that game – you ask Christian Peter, you ask Aaron Graham – we knew we were going to win that game. There was no question going down there whether we would win or not. It was just the question of ‘How much were we going to win by?’ It was as different attitude, a different outlook. And you saw what happened. Q: Any one game stand out to you? BB: They all do, because they all counted. Everybody will probably talk about the time when we went to Miami and Coach Osborne gave his halftime speech. It happened like everybody says, what he said was going to happen. But to me, every game – every game that we were a part of – they were all important. They all had something meaningful to it. If you ask me what the most momentous game is? Probably the most momentous? We go to Colorado. And this was one to save somebody’s(Frank Solich’s) job. Yeah, we were all there. And there were a lot of people who had counted us out. And there’s a football team that put a lot of trust – 105, 125 guys got ready to go to this game versus Colorado – they knew it, we knew it, and certain people didn’t say it, but other people told us, “We have to win this one for our coach.” And we did! And when you win a game -and we know it, we’ve all been kids- we left it all on the field that day and then some. And in that locker room they thought they had done something that nobody else could do. And on Sunday afternoon they found out that it was not enough. Momentous? Yes. Because I watched for the next 48 hours: a bunch of kids who had given everything, trusted the system, and then it was like a part of their body was just cut off. I don’t understand that diplomacy, don’t understand those politics, but I do understand kids. Bryan is a fairly philosophical fellow, and I hope you got the gist, just one iota of his mad, multitudinous methods when it came to training the student/athletes. Never the flashiest, most physically imposing or social-minded guy, he instead excelled at getting an athlete one-on-one and finding their trigger points, mental blocks and physical inequalities to strengthen up and smooth over. A master motivator in his own right and a quasi-team player/rebel, Bryan lunged, sprinted and marched to the beat of his own drum… bongos, even. I say that in jest, because we all know that every jest contains a modicum of truth. And truth is what he was always in search of: the truth about human beings and their reaction to various mental stimuli and distresses, not to mention bodily ones. I recall the old John Cougar Mellencamp song, Hurts So Good, when it comes to Bryan and the footballers, because he could bring on the hurt, yet they knew it was eventually for their good. We heard how Bryan was a fellow apostle with Coach Tom Osborne in his care for the student/athletes, as well as his belief in the process of collegiate athletics. 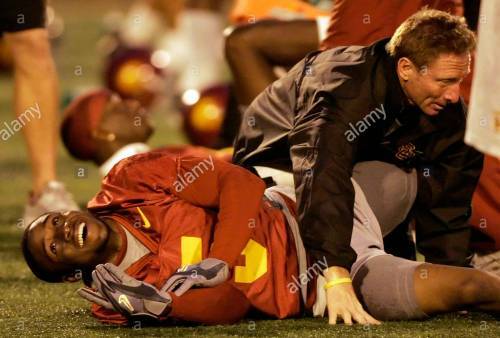 In speaking to Bryan and the other Eminence Outliers I have come to notice that, despite career specialty, it all boiled down to having the utmost care for the athlete’s welfare in mind, not their own personal egos. (Maybe I should rename the term EEO’s: Ego-less Eminence Outliers) Kids can spot a phony from a mile away, and one could sense the gravitational pull these types of individuals –like Bryan- had on them. The beauty of it was that the Athletic Department was burgeoning with these kind of people, some in every department for every student/athlete and not just the football team. Talk about sharing the wealth. And speaking of wealth, I think it’s important to remember some crucial numbers, or more appropriately, the ratio 278:14. If your team makes it to a conference championship and then to a bowl game, this is the top end: 278 training days:14 gamedays. Back in the great 60 & 3 era no conference championship game existed, so it was more like a 278:12 or 13 ratio. To think that 278 days of training and preparation all boiled down to only a dozen to thirteen opportunities for the average college football player to show what he is made of in competition, it further evidences the sense of urgency and seriousness with which they all took their tasks. In building and/or maintaining a legacy, a tradition, the stakes sure were high. They still are. Maybe even more so. The last thing I’ll mention is something I touched on much earlier, which pertains to the weakness, the fragility of the common student/athlete’s psyche. Bryan’s remark, “you understand that they can be really scared of a lot of things, that they can be ridiculed for who they are, for what they do” makes me much less apt to rage at the TV when a kid misses a block or drops a pass or muffs a tackle. It’s not as if they are professionals with just that week’s game as their one and only focus, but these young adults are also juggling class attendance, homework assignments, paper-writing, lab sessions and tests at a nonstop pace. It’s a pressure cooker to be sure, and thinking back to the period when I was that age I’m not sure if I would have been comfortable with a national television audience observing my every move.